While the acoustic guitar instrumental field will never be as populous as the piano genre, it is still increasing in volume of recordings. However, there are a mere handful of artists who exist at the upper echelon of the genre and one of them is undoubtedly Robert Linton. After only three recordings (previous releases were Whisperings At Nightfall and Throughout the Autumn Light) Linton has become one of my personal favorite artists (and not just as far as acoustic guitar music goes). Beyond the Clearing solidifies his standing with me and should do the same with all fans of his type of music. Linton is both a gifted musician and a wonderful composer who infuses deep, honest emotion into every song without resorting to being pointlessly flashy or showcasing his technical ability with pointless solos. Instead, he relishes the opportunity to play with other talented artistic souls (on this album, he is joined by Heidi Breyer on piano, Jeff Oster on flugelhorn, Jill Haley on English horn, Jeff Pearce on ebow, Sara Mionovich on violin, Kitty Thompson and Stephen Katz on cello, and Adam Miller on guitar). You may notice the absence of electronic keyboards and also drums or percussion. These two missing pieces, if you will, indicate how subdued and subtle these nine tracks are. I have previously described Linton’s music as autumnal, being perfectly suited for that time of year when leaves turn and fall, the air becomes crisp, and the skies tend to grey clouds more often than bright sunlight. It is this setting which would be perfect in which to listen to Beyond the Clearing, i.e. taking a drive through a rural part of the country, e.g. the rolling hills and quaint farmland in southwestern Wisconsin’s driftless area. What Linton has mastered with his music is making it somber without necessarily infusing it with melancholy or mournful elements. It is simple, uncomplicated music, but rich with nuance; it is slow-paced but not somnambulist-like. That said, I suppose one could put this on at bedtime and use the gentle melodies to ease oneself into sleep; but for me, this is music to delve into deeply and let it carry me on an inward journey of reflection or remembrance. I could potentially also see it as the perfect accompaniment to reading late at night, although again, these songs deserve to be paid attention to in order to fully experience their emotive impact and to appreciate all the care and attention to detail that went into making them (listen to Breyer’s soft and minimal piano playing on “Gathering Over the Surface” for an example of what I am referring to, or Oster’s muted flugelhorn on “Lingering Rustle,” or for that matter, any of many carefully executed accompaniments from the guest artists). On the technical side of things, as if it needs pointing out, Corin Nelsen has worked his usual magic with production, mixing and mastering. His contribution to how superb the album sounds cannot be overstated. 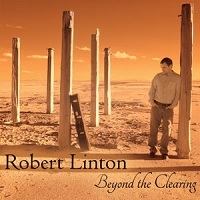 There’s not much more to say except that Robert Linton’s Beyond the Clearing is not just an exceptional recording, but is a true gift to all acoustic instrumental music lovers from a musician who in a short amount of time has achieved a pinnacle of artistry that most will only aspire to.